Plus Size Dresses Have Never Been This Affordable And Accessible Like This Red Chiffon Plus Size Off The Shoulder Mini Dress! Plus Size Dresses are sometimes hard to find these days and whether we like it or not, brands that usually create and sell these kinds of dresses are not bought at a low cost and they can never be cheap. But I fortunately happened to encounter this website that do not only cater to girls who are petite or slim, but also to those who want to show off their attractive curvy body with these dresses that look beautiful for plus size women and are also trendy and comfy. This dress looks really fresh, airy and comfy because it is made of chiffon. I really admire the mini off the shoulder style that shows a subtle hint of sexiness without showing too much. 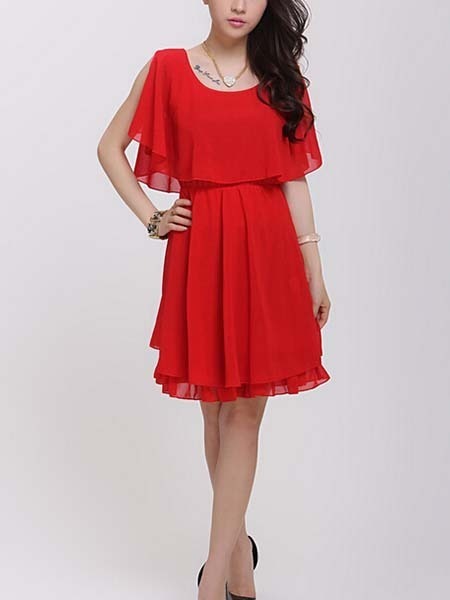 It’s the perfect Red dress for that casual evening summer party and also comes in tons of colors too. You can choose from Pink, Tiffany Blue, Beige, or Black. You can choose one that will suit your flavor and style. It’s currently available in the sizes S M L XL XXL 3XL. It is very affordable because it currently only costs an amazing PHP594 (88% Off) which originally costs about PHP5142! You get to save about PHP4548. That’s an incredibly huge saving for something so beautiful to wear! Transactions for payment are made through PayPal which is a 100% guaranteed safe method. Want fast shipments? Here’s to Express Shipping because they can deliver your item in just a matter of 3-5 days! If you want to get more gigantic discounts, subscribe to the website and get your free coupon codes. Browse through pages of different fashionable and beautiful dresses in this website just by clicking on this LINK. SPENDING HAS NEVER FELT THIS LIGHTHEARTED!